November 5th is a date that’s dreaded by many pet owners. While other people are outside enjoying the fireworks you end up desperately trying to comfort distressed pets. It’s gotten worse in recent years as fireworks get set off for a week around Bonfire Night! 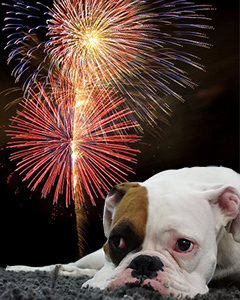 We’ve compiled some advice on how to keep your dog or cat happy during Fireworks Night. Including how to use aromatherapy to calm you both down! This one is difficult to follow as it’s so upsetting to see your pet distressed. However, if you make a big fuss of your dog the message you're sending is that they're right to be scared. It’s better to try and prepare in advance for what’s going to happen. Do your best to ignore them if they are getting worked up on the night. Give them plenty of positive attention when they're acting calmly to reinforce that everything is fine. It’s a good idea to make this somewhere enclosed so your pet will feel like they're shielded from what’s scaring them. Make them a nice den behind the sofa or get them a bed with a cover on it like the Pet Cave or Pet Parade Pop Up Pet Bed. Dogs will get extra comfort from having something that smells of you. Try placing some of your old clothes into the den. Cats don’t respond the same and should be left to hide where they want to as long as it’s safe. Don’t try to move or pick up your cat when it’s stressed or it will become more upset. You may think that your house and garden are escape proof but you should perform a check a few days before the fireworks. There may be things you’ve overlooked that need to be secured in advance. Check that your pet’s microchip details are up to date just in case they manage to escape. If your dog needs to go to the toilet during fireworks night, keep them on a lead even if you’re just going into the garden. For a lead that helps you keep your dog secured to you, try the Pet Parade Reflective Wrist Strap Dog Lead. Create a relaxing atmosphere in your home to distract your pet from the noises outside. By keeping the television or music on you can provide calming background noise. There are several pheromone-based products available that can help to keep pets calm. Essential oils have also been found to work on animals. A study on horses found that lavender oil had a calming effect on them when they heard a loud noise. The horses in the study who’d smelt lavender had a much lower heart rate after an air horn was blown than horses who’d had no aromatherapy. An aroma diffuser packed with Amora Pure Essential Oils 5 Bedtime will help both you and your pet to enjoy Bonfire Night.